Many people say that they are a professional this or that and the term professional has been used so loosely sometimes that we have lost sight of what true professionalism is. Webster Dictionary defines a professional as someone who “participates for gain or livelihood in an activity or field of endeavor”. Throughout my life I have hunted with and encountered many people from all walks of life and professions that were called professionals and by the above definition I guess they were but very few are what I would call a true professional. On my resent safari to Namibia I was blessed and honored to hunt with someone who is a true professional in every sense of the word. Johann Veldsman with Shona Hunting Adventures is a registered Dangerous Game PH in Namibia and a member of countless professional hunter organizations. But his professionalism goes well beyond his impressive credentials. I witnessed first-hand someone who is committed to making every clients hunt the hunt of a lifetime. I spent 13 days with a man who has the eyes of an eagle, the legs and stamina of a mountain goat, the craftiness of a leopard and the wisdom of an old kudu bull. It didn’t take me long to learn that if we were sitting on top of a koppi glassing that I could use my binoculars and he would point out different animals but other than that I had no need for them, and the thought that I would spot an animal before Johann was laughable. and a few other animals on my list. We had some unsuccessful attempts at the Gray Ghost until the evening of our 8th day. That evening we left the lodge at 3:00 in the afternoon and went to a couple lookout points to glass. We saw a few young kudu bulls but none that were shooters. 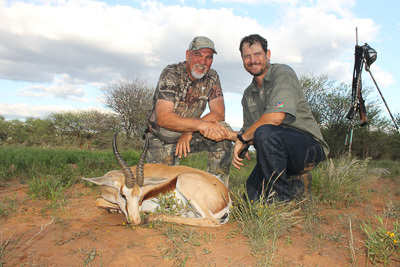 After a couple of hours, Johann spotted a Gemsbok bull that was bigger than the first one I had taken and we started after him because I had two Gemsbok on my list. After getting busted by some Springbucks and not getting a shot at the Gemsbok, Johann looked at me and said let’s head for the koppi in front of us (about a mile away) and go see what we can see from on top. So we start walking across the flat toward the koppi. My foot landing where his had just left, Johann stops, eyes dart to the left, he says “young kudu bull” . Wow i didn’t even see him. We start walking again, eyes dart to the right, nice Gemsbok cow, and on it goes until we reach the koppi. Once on top of the koppi Johann glasses the flat area on the east side but doesn’t see anything worth going after, so we start moving to look at the flat on the west side and Johann spots him about 300 yards away. All I can see is his body and I realize that he is big. Johann says “this is the one we have been looking for”. We start down the koppi in a direction away from the kudu bull so as to not make any noise to scare him off. Once down on the flat we use bushes and small trees for cover to get close. Slow and deliberate heading to where I can get a shot. Finally we get to within 80 yards of where the bull is feeding and the shooting sticks go up. When I put my rifle up all I can see of the bull is his horns and they look massive through the brush. Johann asked if I had a shot and I told him no. He said that he will turn to the left and when he walks into the opening shoot him. How did he know that’s exactly what this bull was about to do? A true professional knows. When the Old Gray Ghost stepped into the small opening, I pulled the trigger of my Winchester 300 mag. The shot felt good, Johann said it looked good and sounded like a good hit. The bull turned and ran about 80 yards, with us running after him trying to get a second shot. When we got to the place where he was standing when I shot, Johann raised his binoculars then turned and said he’s down. We watched him fall about 80 yards away. We gave each other high 5’s and then hugged like two brothers that had just accomplished a great feat. When we got close we both saw just how big this bull was. Being the true professional that he is, when we were about 100 feet from the bull, Johann told me to go get my trophy while he hung back to let me spend a couple of minutes with my trophy alone. His attention to details, his ability to adjust to each client and yet at the same time getting each client to step out of his comfort zone and move to a higher level is just some of the characteristics that make Johann Veldsman a true professional in every sense of the word. Thanks to him, my hunting trip of a lifetime turned into the first of many trips I will make to Africa to hunt.